Condition: Choice and intact, small internal fissure in the stone. Provenance: Jan Novak collection, Sweden, ex Victoria Lindström inventory, 1950s. 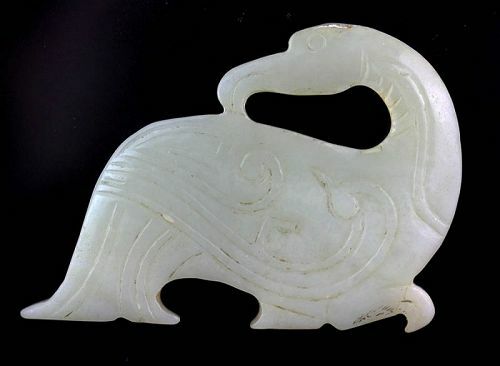 Interesting Chinese Neolithic jade pendant of Bird, 3rd.-2nd. mill. BC Exceptional Chinese Jade pendant of animal, Zhou Dynasty - Ex. Lee Rare early Chinese Jade carving pendant, Ex. Victoria Lindström!